With an area of 237,499 square kilometers, Romania is slightly smaller than the Federal Republic of Germany (West Germany) and is the twelfth largest country in Europe. Situated in the northeastern portion of the Balkan Peninsula, the country is halfway between the equator and the North Pole and equidistant from the westernmost part of Europe--the Atlantic Coast--and the most easterly--the Ural Mountains. Of its 3,195 kilometers of border, Romania shares 1,332 kilometers with the Soviet Union to the east and north. 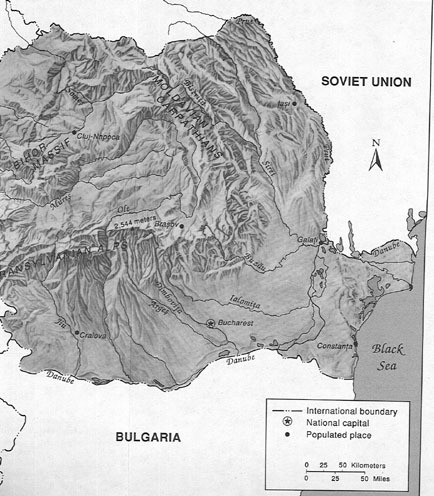 Bulgaria lies to the south, Yugoslavia to the southwest, and Hungary to the west. In the southeast, 245 kilometers of Black Sea coastline provide an important outlet to the Mediterranean Sea and the Atlantic Ocean. Traditionally Romania is divided into several historic regions that no longer perform any administrative function. Dobruja (see Glossary) is the easternmost region, extending from the northward course of the Danube to the shores of the Black Sea. Moldavia (see Glossary) stretches from the Eastern Carpathians to the Prut River on the Soviet border. Walachia (see Glossary) reaches south from the Transylvanian Alps to the Bulgarian border and is divided by the Olt River into Oltenia on the west and Muntenia on the east. The Danube forms a natural border between Muntenia and Dobruja. The west-central region, known as Transylvania (see Glossary), is delimited by the arc of the Carpathians, which separates it from the Maramures region in the northwest; by the Crisana area, which borders Hungary in the west; and by the Banat (see Glossary) region of the southwest, which adjoins both Hungary and Yugoslavia. It is these areas west of the Carpathians that contain the highest concentrations of the nation's largest ethnic minorities-- Hungarians, Germans, and Serbs. Romania's exterior boundaries are a result of relatively recent events (see fig. 2). At the outbreak of World War I, the country's territory included only the provinces of Walachia, Moldavia, and Dobruja. This area, known as the Regat or the Old Kingdom, came into being with the disintegration of the Ottoman Empire in the mid-nineteenth century. At the end of World War I, Romania acquired Transylvania and the Banat. Some of this territory was lost during World War II, but negotiations returned it to Romania. Although this acquisition united some 85 percent of the Romanian-speaking population of Eastern Europe into one nation, it left a considerable number of ethnic Hungarians under Romanian rule. Disputes between Hungary and Romania regarding this territory would surface regularly, as both considered the region part of their national heritage. Questions were also periodically raised as to the historical validity of the Soviet-Romanian border. Bukovina (see Glossary) and Bessarabia (see Glossary), former Romanian provinces where significant percentages of the population are Romanian-speaking, have been part of the Soviet Union since the end of World War II. Despite ongoing and potential disputes, however, it was unlikely in 1989 that Romania's borders would be redrawn in the foreseeable future.